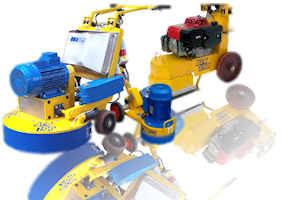 The DFG700 has all the benefits of the popular single and twin head DFG machine but also allows the operator to grind large areas to a fine finish eliminating swirl marks that can be left by conventional grinding methods. The Main drive plate is driven through a heavy gearbox and each grinding tool is then turned independently at an increased RPM. The DFG700 has a variable speed control devise to suit various applications. Environmental considerations are fully controlled with an adjustable dust extraction skirt for dry use and a facility for using water when wet grinding. A major advantage of the DFG700 is the option of a 3-phase electric motor or gasoline/diesel powered engines. This gives a unique versatility for outdoor use or when electrical power may not be available.